A versatile multi word stamp featuring 11 commonly used phrased for office documents. 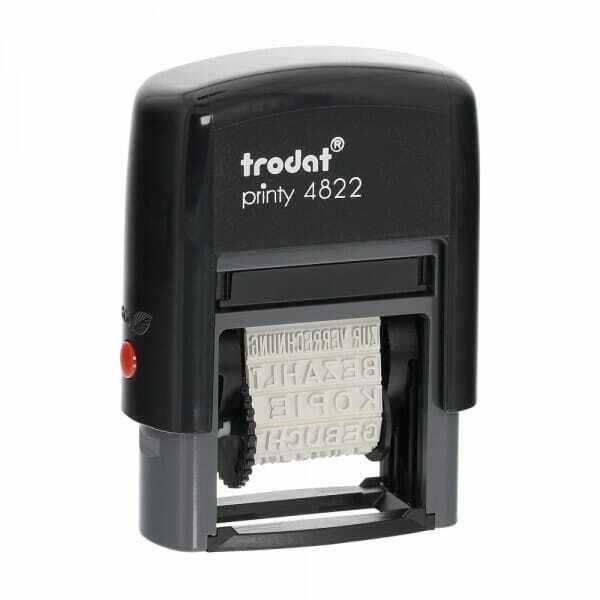 The Trodat Printy 4822 comes ready-to-use with with the following phrases: CANCELLED, ORIGINAL, FIRST CLASS, FAXED, E-MAILED, APPROVED, COPY, CONFIRMATION, DRAFT, CONFIDENTIAL and ENTERED. The impression size is 25 x 4 mm. It is environmentally friendly as it is produced from a high content of recycled plastic. This stamp is a self-inking stamp with a built-in ink pad to last for many thousands of sharp and clear images. Customer evaluation for "Trodat Printy 4822 Multi Word Stamp"